TABI・SQUARE｜Sharing Nara’s/Japan’s products with the world, attracting people to Nara/Japan from the world. Shop TABI-JI closed the pop up store in SCRAPBOOK (JEANASiS) in Harajuku, Tokyo. Shop TABI-JI closed the pop up store in Tokyu Hands Nara. Our new specialty store of Nara “WADAN Nara Higashimuki” is just opened. Our new specialty store of Nara “WADAN” will be open at Nara Higashimuki shopping arcade on Jan. 22 (Mon). Shop TABI-JI closed our POP UP SHOP at「Discover Japan Paris」in Paris, France. Shop TABI-JI will open our POP UP SHOP at Discover Japan Paris in Paris, France, September 22 (fri.) - 28 (thu.). TABI SQUARE (Shop TABI-JI) has celebrated the 10th anniversary since our foundation. Our deepest gratitude for everyone who has supported us. Our new branch "Shop TABI-JI Nara-koen" is just opened. Our new branch "Shop TABI-JI Nara-koen" will be open at the entrance of Todai-ji Temple on October 20 (Thur.). Our new branch "Shop TABI-JI Kamakura・Hase" is just opened. Our new branch "Shop TABI-JI Kamakura・Hase" will be open in Hase in Kamakura city, Kanagawa on September 24 (Sat.). 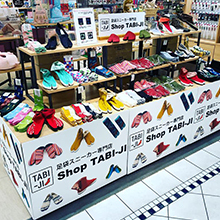 Shop TABI-JI's original socks are now on sale at the "Nara-ni-Yoshi" section (featuring the local industry) in the Tokyu Hands Nara Store. Shop TABI-JI joined the "JAPAN TOUCH" fair in Lyon, France. Shop TABI-JI's special space will be opened in “SCRAPBOOK (JEANASIS)” in Harajuku, Tokyo for one year from October 16th (Fri.). Shop TABI-JI closed our limited- shop at DISCOVER JAPAN in Paris, France. Shop TABI-JI will open our limited- shop at DISCOVER JAPAN in Paris, France, July 7 (Tue.) - 13 (Mon.). Shop TABI-JI joined in the "Chin Yui Sodategusa" fair in Yamatokoriyama City, Nara, May 16(Sat.) & 17(Sun.). Shop TABI-JI will join in the "Chin Yui Sodategusa" arts and crafts fair in Yamatokoriyama City, Nara, May 16(Sat.) & 17(Sun.). Shop TABI-JI will Join the “rooms30” held on Feb.17th (Tue.) – 19th (Thu.) as a part of “Tsugi no Nara Mono” booth. Shop TABI-JI will Join “The 79th Tokyo International Gift Show Spring 2015,” held on Feb.4th (Wed.) – 6th (Fri.) as a part of “Nara Prefecture” booth. Shop TABI-JI joined the “Shoutengai no ippin-ichi” fair at the east entrance of JR Nara station, Nov.16. Shop TABI-JI will join the “Shoutengai no ippin-ichi” fair at the east entrance of JR Nara station, Nov.16. Our new branch “Shop TABI-JI Higashimuki” has opened in Higashimuki Branch of Naramachi Nagaya, located in Higashimuki Shopping Street in Nara city. Shop TABI-JI closed our limited-time shop in Abeno Harukasu Kintetsu Department Store, Osaka (June 5 - 11). Shop TABI-JI will open our limited-time shop in Abeno Harukasu Kintetsu Department Store, Osaka (June 5 (Thu.) - 11(Wed.). Shop TABI-JI joined in the "Chin Yui Sodategusa" fair in Yamatokoriyama City (May 17 & 18). Shop TABI-JI will join in the "Chin Yui Sodategusa" arts and crafts fair in Yamatokoriyama City, May 17(Sat.) & 18(Sun.). One-year limited time shop “WADAN” (in Nampa Parks in Osaka) has been closed on Wednesday, February 26th. In-store SUMI-E Japanese calligraphy live painting event at WADAN (in Nampa Parks in Osaka) has been finished. In-store SUMI-E Japanese calligraphy live painting event will be held at WADAN (in Nampa Parks in Osaka) on Jan. 9 (Thurs.) & 10 (Fri.). In-store SUMI-E Jpanese calligraphy live painting event at WADAN (in Nampa Parks in Osaka) has been finished. In-store SUMI-E Japanese calligraphy live painting event will be held at WADAN (in Nampa Parks in Osaka) on Oct. 17 (Sun.). Shop TABI-JI's limited-time shop in the Hankyu Department Store (10th floor), Umeda (Osaka), closed. Shop TABI-JI's limited-time shop in Abeno Harukas Kintetsu Department Store, Osaka, closed. In-store Yamato-cha green tea tasting event at WADAN (in Nampa Parks in Osaka) has been finished. In-store Yamato-cha green tea tasting event will be held at WADAN (in Nampa Parks in Osaka) on Aug. 10 (Sat.) & 11 (Sun.). Published "Nara Explorer" Special Edition 2013, Nara City Guide in Traditional Chinese. 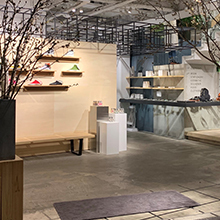 A new Japanese item shop "WADAN" will be open in the NAMBA PARKS (1F) on March 8 Fri.
Shop TABI-JI's English website has opened. Shop TABI-JI will open our limited-time shop in Tokyo (Nara Mahoroba-kan), Nov. 15 (Thurs. )- 20 (Tues.). We opened our pop up store in SCRAPBOOK (JEANASiS) in Harajuku, Tokyo. We opened our pop up store in Tokyu Hands Nara. ©2012 TABI・SQUARE Inc.　All rights reserved.